A digital marketer, Ifeoluwa Adegoke, caused a stir on the social media on Thursday after sharing her encounter with some operatives of the Special Anti-Robbery Squad in the Ikorodu area of Lagos State. Adegoke said she was forced to part with N5,000 to save her life and that of her colleagues, who were accosted by the policemen around 1.20pm while going for a photo shoot. The victim, who shared a snapshot evidence of the fund transfer and the photo of one of the policemen, alleged that the operatives threatened to kill them. “With my encounter today, it is safe to say SARS men are armed robbers. I was going for a photo shoot in Ikorodu today (Wednesday) and armed robbers SARS pulled us over and made us pay for no reason, threatening that they were gonna waste our lives. I made a transfer so they can be traced,” she wrote on her Twitter page. 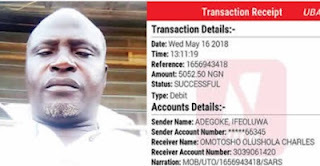 The tweet went viral as some Nigerians, who lived in the Ikorodu area, identified one of the policemen, Inspector Omotosho Olushola Charles, as a habitual extortionist. They alleged that Charles had forced them at different times to part with various sums of money without committing any offence. Adegoke, who later shared her ordeal in details, said the encounter gave her a new perspective of SARS men. She said, “My colleagues and I left Surulere for Ikorodu, where we were to do a photo shoot. We were four in the car and I was the only female. “When we got to Ikorodu, the SARS operatives, who were in a vehicle, asked our driver to stop; they were five in their bus – all fully armed. “They said we were suspected criminals and asked us to come down. They asked the driver to come down too. They checked the car, took our phones and went through them. When they did not find anything, they said we were thieves and cult members. She explained that after the search did not yield any fruit, the officials demanded N100,000. Adegoke said she took the operatives through her social media account to show them that they were managing to survive. “But they said they did not care. I told the inspector that since we were not the kind of people they were looking for and since they did not find anything incriminating on us, they should just release us. “They said they were going to release us because we were not the kind of people they were looking for; but they won’t release us for free. They started cocking their guns to threaten us; they said they would shoot us. “I approached one of them and begged that we did not have the N100,000 because we were only young people searching for our daily bread. I told him that I had just N5,000 in my account and he should allow me to transfer it to them,” she added. She noted that the men refused to accede to her request, just as she remained adamant so as to have evidence of the extortion. The social media enthusiast said after some murmurs of disapproval, the operatives agreed. “After we did the transfer, they did not allow us to go until they got a credit alert on their mobile phone. The policeman who released his account number told the others that he was with his ATM card and he would withdraw the money for them to share. 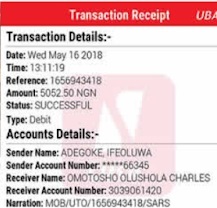 “When we left, I traced the name and discovered that his bank account name, Omotosho Olushola Charles, is the same he uses for his Facebookaccount. That was how I got his picture,” she added. The victim, who demanded that the policemen should be rounded up and prosecuted, said she and her colleagues could have been killed if they did not have any money on them. She described the experience as an “eye-opener,” urging the authorities to reform the police force. The Head of the Public Complaint Rapid Response Unit, Abayomi Shogunle, said Adegoke’s complaint had been received, adding that the police inspector had been arrested. “My dearest @ife_luv12, I am glad to inform you that the account owner has been identified – Inspector Charles Omotosho, FSARS Ikorodu, Lagos. He is in custody; preliminary investigation ongoing. PCRRU will inform you on the next line of action. Sorry for the experience,” he tweeted. The spokesperson for the Lagos State Police Command, SP Chike Oti, confirmed the arrest of the inspector, adding that the police authorities were investigating the incident.